As from the third week of February 2012 we will have a new Whitby Morrison conversion on a 2009 plate Mercedes Sprinter available for hire to all events, celebrations or part window branding. This ice cream van has the new Carpigiani Rapido mark11 fitted which promises to be faster then all previous Van Uno models. The ice cream van has a shorter off side servery window that sits flush with the chiller and freezer, this cuts out the gaps between the window and freezer. The ice cream van is a fully fitted Cummins conversion with balloon man interior work tops and ceilling plus stainless steel top on the chiller and rear four double lid chiller. Consisting of a front passenger seat, twin slush machine and a rear compartment for the motors that drive the refrigeration unit. Internally there is a few sweet shelves plus a very small shelf between the servery window and soft ice cream machine which stands above the cone box holder. We always keep all of our ice cream vans in good order mechanically and presentation as we have some very high profile bookings for corporate and film which demand a unit to be in top presentable order. Honours ice cream van hire available for all your 2012 summer celebrations around London and Kent, street parties, school parties, fetes, sporting events plus corporate hospitality and promotional ice cream van hire. We have recently taken part in a film around West London which featured quite a few ice cream vans. We were only used for a one day shoot early February but they were using up to 4 different ice cream vans for their seven weeks of filming, the film is to be screened some time in 2013. A few days latter we were booked to pop over to the London ITV Studios . The plan was to get in position a few miles from the studios and when a vocalist from the 2009 Xfactor program took off in an open topped red bus with his 20 or so fans on a short tour around London and selected tourist attractions. We would then recieve a call to come to the venue and get into position for their return, this was a small lay by directly in front of the ITV Studios building. Our call came and we made our way in to position, not long after the open top red tour bus parked behind the ice cream van and the fans and singer came over and spent fifteen or so minutes serving ice creams to all. The temperature was below zero as our scoop water had frozen, we cleared the ice cubes from the container and within a few hours the ice had returned. This is the time my scoop water has frozen in twenty years so it must have been pretty cold that day. This was all over within a quarter of an hour and we set off back to base.The venue had photographer’s and ITV filming for an new program which should be announced within the next month or so. 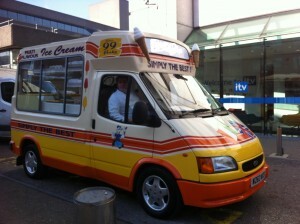 Honours Ice Cream van for hire to all events throughout London and all southern regions of the UK.